These sweet little bandana print fabric hair bows are completely adorable and match our cute little bandana twirly dresses! 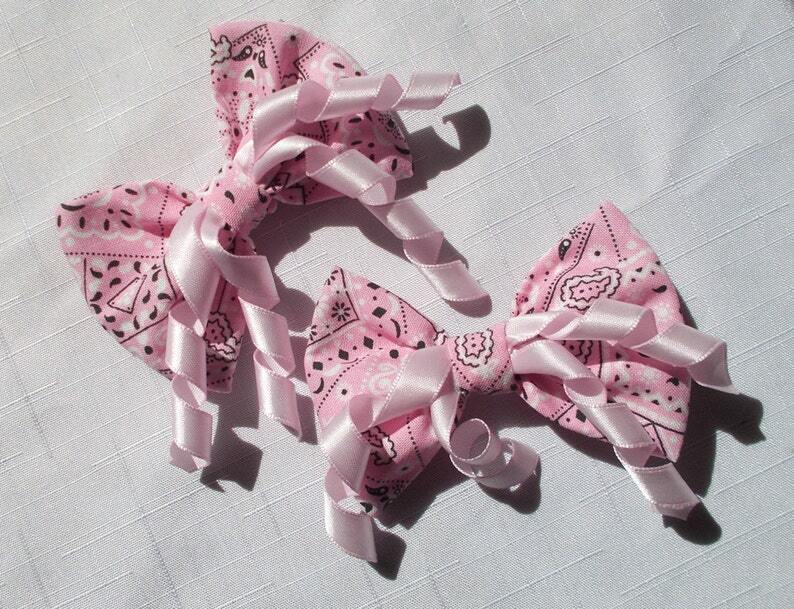 Available in Pink, Red, Purple, Lime, Turquoise or Hot Pink bandana print, with matching ribbon curls. Your choice of small barrette, or alligator clips. Beyond impressed with this dress. Very well made, beautiful material, and arrived in time for the photo session for my daughters first birthday! This is the Easter/family portrait outfit of my dreams for my little guy! My Son Loved it Bec! and I Thank You very much for your outstanding craftsmanship on what you do and what youdid for my Son. I will definitely be reordering from you again soon. Thank You again. I accept payment via credit card, or paypal. Orders can not be cancelled once the production of order has begun. Returns are not available as the time and supplies are not replaceable. However, it is possible I will exchange the item for a different size, or item of equal value. I will not accept returns or exchanges on custom orders or personalized items. If you find an item is defective, please contact me and let me know the problem. Defective items can definitely be exchanged. Any requests for exchanges must be made within 10 days of delivery. Kansas customers will be charged a 7% sales tax fee. Orders can not be cancelled once the production of order has begun. Returns are not available as the time and supplies are not replaceable. However, it is possible I will exchange the item for a different size, or item of equal value. I will not accept returns or exchanges on custom orders or personalized items. If you find an item is defective, please contact me and let me know the problem. Defective items can definately be exchanged. Any requests for exchanges must be made within 10 days of delivery. Shipping is nonrefundable, and 20% of the purchase price will not be refunded if the item returned is not in the original packaging and folded neatly when it arrives at my shop. All shipping is via USPS. I choose the method that will work best to get the item to you in a timely manner. Express shipping is available at an added charge, contact me for further information and pricing. I do ship internationally. PLEASE NOTE: Although I wish I did, I have NO control over the USPS, or the package once it leaves my workshop. I am not responsible for items delayed due to problems with the shipping company. All of my items are made to order - allow 3-4 weeks before shipment. It may take longer during especially busy times such as holiday seasons. Please contact me if there is a specific date you need your item for. Custom orders are available, please contact me and I will be happy to work with you. I stand behind my products and will do my absolute best to meet or exceed your expectations. Bizzy Bumpkins reserves the right to reproduce custom made items. Bizzy Bumpkins reserves the right to photograph all items created and may use photos at our discretion for advertising or as samples inside listings. All photos of completed work are the property of Bizzy Bumpkins and cannot be used without express written permission. All designs are the property and copyright of designer Bec Mueller.